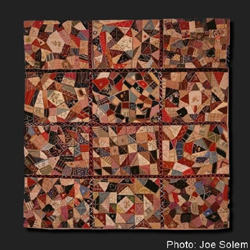 "Crazy quilt." Consists of twelve squares, joined together with black binding and colored ribbon crisscrossed over binding. Short messages, names and intials are embroidered on patches. "Hooheno_ opua", "__ a wela", "Na'u oe", "Charity", "Kalei", "Lani", "S.A.P. ", "J.K._", "C.R._", "1890". This quilt was given as a wedding present to Mr. & Mrs. Abraham Piianaia by the girls of St. Andrews Priory. Abraham Charles Piianaia (born on Lanai 6/7/1868, died in Honolulu, 7/11/1941) was one of several Hawaiians sent to Europe for schooling by Kalakaua. Piianaia arrived in England in1882, and entered St. Chad's school in Denstone. He remained in England until 1887, when most of the Hawaiian young men were recalled home. On his return, Piianaia taught in private and government schools, later employed in a law office and also as a civilian worker at Pearl Harbor. He married Fanny Malulani in Honolulu on July 24, 1890.